Nguyen Sang (born on August 1st, 1923 and died on January 2nd, 1988) was born in Dieu Hoa commune, Chau Thanh district, Mi Tho province (now Tien Giang province). He lived and worked at 65 Nguyen Thai Hoc, Dien Bien ward, Ba Dinh district, Hanoi for a long time. 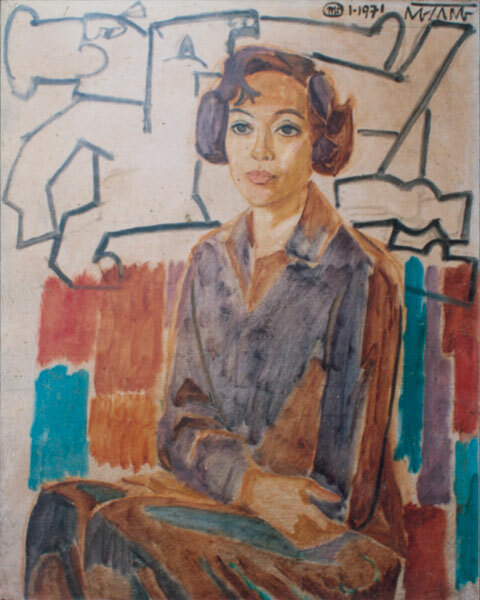 He used to study at Gia Dinh Fine Arts School (1936 – 1938) and then he continued studying at the Indochina Fine Arts College class 14 (1941 – 1945). He was a member of Vietnam Fine Arts Association from 1957; Member of the Executive Committee of Vietnam Fine Arts Association, 1st tenure (1957- 1983); artist of composing group of Vietnam Fine Arts Association; First Prize in the national fine arts exhibition in 1954. Nguyen Sang was one of the legendary painters in the Indochina Fine Arts College. Moreover, he was considered as the leader of 4 masters “Sang – Nghiem – Lien – Phai” in Vietnamese Contemporary Fine Arts. Although he was taught by Western teachers, his soul and his art were directed at Vietnamese people and Vietnamese Revolution. 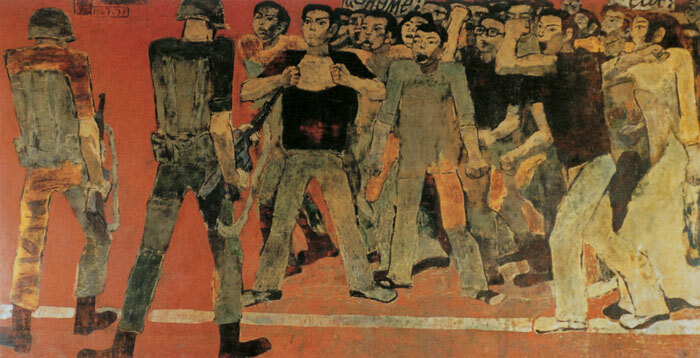 Nguyen Sang was one of the painters joined the revolution over the first days. In 1945, he took part in the government seized power in Hanoi Lieutenant. The spiritual atmosphere at that historic moment motivated him execute a great painting “Unity”. The artwork was displayed in the central city after the victory of the August Revolution. It made a significant contribution to promote patriotism of Vietnamese people at that time. In addition, he participated in revolutionary agitation and propaganda, banknote design and the exhibition celebrating the first National Day of the Democratic Republic of Vietnam. 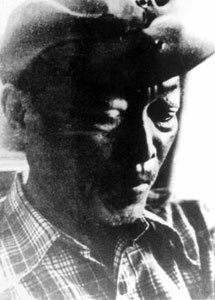 After the August Revolution, Nguyen Sang stayed in Northern Vietnam to and joined the French Resistance. Over the period between 1950 and 1952, he worked for the Propaganda Committee of the General Political Department. At that time, he worked on Lito paintings and carved paintings. 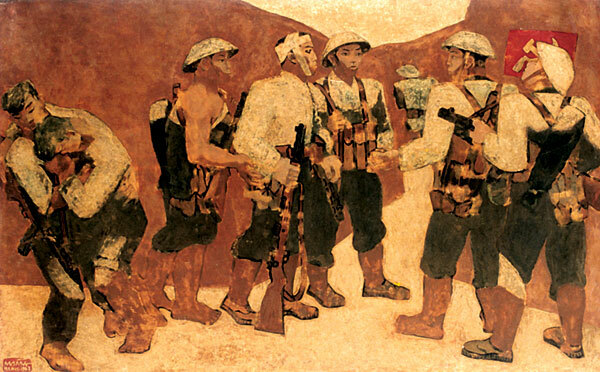 His painting Soldiers and Civilians showed a sign of Nguyen Sang’s strong style in the future. From 1953 to 1954, he joined the Dien Bien Phu campaign. During 9 years of resistance, Nguyen Sang’s career always related to the destiny of the country, civilians, soldiers and intellectuals. At that time, his talent for painting was most clearly demonstrated. He created a large number of great artworks such as Bloody Bo Market 1951), Invaders Burnt My Village (1954), Soldiers Shelter From The Rain (1960), Soldiers Take A Nap On The Hill (1960), National Defense and especially Party Admission Ceremony in Dien Bien Phu (1963) which was considered as Nguyen Sang’s declaration of art. He had artworks of all materials including carved paintings, oil paintings and lacquer paintings that made valuable contributions to Vietnamese contemporary fine arts. Especially, he created a new technique of colors and shades regarding lacquer paintings. Although his experiment on the expression of lacquer following Western style was very successful, he supposed that striking features of lacquer were not clear. Hence, in his later works, he focused on the symbolism which seemed to be drawn from folk art. The characteristics of Dong Ho and Hang Trong were regenerated in his artworks that created an organizational structure. Meanwhile, it could be seen that his paintings were under the influence of national soul and the art of Western contemporary masters such as Picasso and Matisse. These characteristics were adequately demonstrated in the painting Party Admission in Dien Bien Phu which was selected as the best artwork of Vietnamese Contemporary Fine Arts (1998). Besides, the painting Universe was considered as Nguyen Sang’s last work. During his artistic process, he was awarded third-class Independent Medal, Medal for the Cause of Vietnam Literature and Arts, Medal for the Cause of Vietnam Fine Arts. In 1996, he received Ho Chi Minh Prize in Literature and Arts (Phase I) for the artworks: Invader Burnt My Village – oil painting – 80x130cm (1954); Party Admission in Dien Bien Phu – lacquer painting – 112x200cm (1978); National Defense – lacquer painting – 112x200cm (1978); Soldiers Shelter From The Rain – lacquer painting – 70x100cm (1970), A Girl By Lotus – oil painting 80x130cm (1972). Nguyen Sang’s art always directed at the history of resolution and national art. His artworks were among the best paintings (oil paintings and lacquer paintings) whose theme was Vietnamese revolution. His artistic language had a broad generalization and successfully combined traditional art and contemporary world art that made substantial contributions to innovate Vietnamese Contemporary Fine Arts.